The Datsun Go may not enjoy the same status as its classmates from Maruti Suzuki or Hyundai, but being a size larger for the class it sits in, the Go is beginning to make its presence felt. 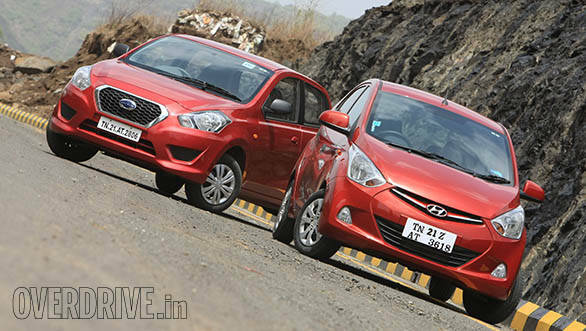 While the Alto isn't too worried, thanks to its established family name, the Eon does seem wary. With its monthly report card showing half the sales than the Alto, the Eon may not only end up sharing the bench with the Go, but also jostling with it for space. Hyundai has therefore prepped it with a bigger engine to face the new opponent. 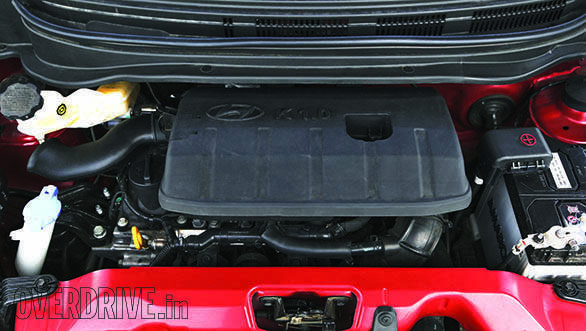 The 998cc motor puts out 69PS and 94Nm and belongs to the older Kappa range from the i10's export model. It has been brought to the Eon in response to numerous consumer complaints that demanded more power and pulling capacity. Like its 800cc sibling, there is noticeable vibration in the pedals at idling speed, but as you get moving the vibes smoothen out. The first gear seems quite short, but the second and third feels fairly tall  and those are the gears that you will cycle through for most of your commutes. The mid-range feels flat and usually calls for a downshift for overtakes. But that said, even in scenarios like scaling flyovers or minor hill-climbs, the Eon doesn't feel out of breath. You do need to rev slightly higher though and when you do, the burble of the 3-pot mill is amplified quite a bit and the vibes in the pedals return. 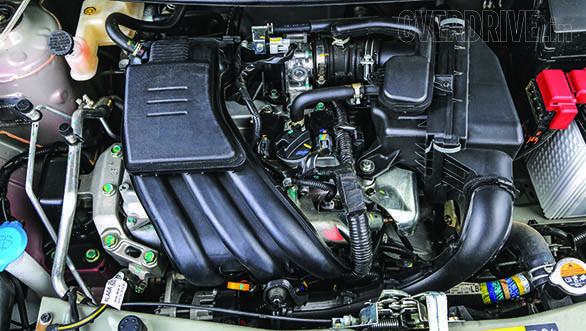 The Datsun Go uses the Micra-derived petrol engine, which edges ahead of the Eon with its larger displacement, but puts out a comparable power and torque. Unsurprisingly, the Eon still manages to sprint marginally quicker, thanks to its lighter body. But that said, it is the Go that feels quicker and lighter to drive. It also feels more agile with a better steering setup. The Eon 1.0's steering is heavier than its 800cc counterpart, but is vague and feels late to respond to steering inputs. But that said, the Eon's suspension feels stiffer and the handling doesn't feel as wallowy as the Go. The Datsun also has a notchier gearbox. The Go certainly feels livelier to zip about in traffic, but the Eon feels more convenient. The shoulder room, on paper, is similar for both the cars. But that is where their similarity ends. 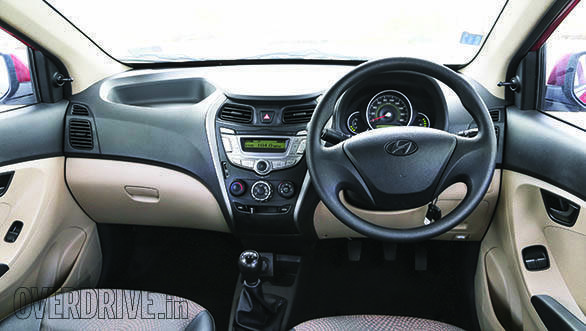 The controversial front seats of the Go feel like a flat sofa and are therefore roomier. The Eon's buckets are contoured nicely and will work well for slimmer passengers, but feel too snug otherwise. 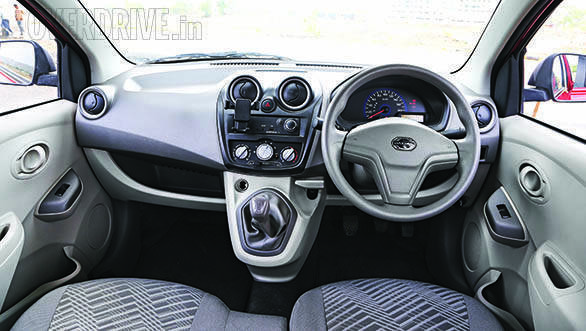 Out of the two, the Eon's cabin looks and feels better and has better equipment too. But while both the cars tick the right boxes for creature comforts, they irresponsibly sideline safety features like ABS and airbags. Since both the cars primarily attract first-timers, active safety tech becomes all the more important. Speaking of first-timers, the Go will demand their attention with its larger cabin and storage space and better pricing. But the Eon, despite being smaller and pricier, edges ahead of the bully since its prim-and-proper form imparts the quintessential feel-good factor that one looks for in their first car. But if I had to put my money down, it certainly would be on the Datsun Go for its old-school charm that screams 'JDM'!